ONCE A DAY AND YOU’LL LOOK BETTER…. 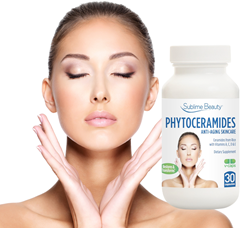 take Phytoceramides from Sublime beauty. “Phytoceramides have been called the closest thing to a fountain of youth. Ceramides make up 40% of our skin, and are responsible for moisture, plumpness, and protection. Yet they diminish as we age, and this (along with loss of collagen) is a major factor of wrinkles, sagging, and thinning of skin.Taking a natural Phytoceramide (“Phyto” means plant, the plant derived ceramide is identical to human) replenishes the supply of skin ceramides from the inside out. Cermides are formed in lower levels of skin and then “percolate up” to the skin’s surface, which takes about a month.Phytoceramides have long been used in Japan and Europe. Sublime’s are Rice-Derived. So swallow this pill every morning and look better every night….